Food and Agriculture Organization (FAO) recently launched the Water Productivity Open Access Portal (WaPOR) to monitor and report on agriculture water productivity over Africa and the Near East. The tool has gone live, tapping satellite data to help farmers achieve reliable agricultural yields and optimized irrigation systems. Additionally, productivity databases and underlying map layers can easily be accessed by users.The tool allows direct data queries, time series analyses, area statistics and data download of key variables associated to water and land productivity assessments. The tool’s database sifts through satellite data and uses Google Earth computing power to produce maps that show how much biomass and yield is produced per cubic meter of water consumed. The maps can be rendered at resolutions of as little as 30 to 250 meters, and updated every one to ten days. Originally published on FAO Website. “We’re at the forefront of understanding how we can make the most of soils to remove carbon dioxide from the atmosphere,” said Rolf Sommer, principal soil scientist. However, using the best management practices available should boost farm productivity and efficiency without putting additional stress on farm resources, finances or workloads of men and women.Moreover,these practices should be compatible with the realities of farmers. It may take only little incentives for a farmer to adopt soil conservation practices that significantly reduce losses of carbon from soils. As scientists work to beat climate change, 500 experts from around the world will discuss protecting the largest carbon store we have: soils,at the Global Symposium on Soil Organic Carbon (GSOC17) on March 21st – 23rd. Originally published on CIAT Website. Have global emissions changed since the Paris agreement? A lot has happened since countries met in Paris in 2015 and agreed on an accord to combat climate change. So far, more than 140 countries have ratified or otherwise joined the Paris Agreement, representing more than 80 percent of global emissions. Several major economies, including Canada, Germany and Mexico, have also developed long-term plans to decarbonize their economies. As countries implement their targets and policies and develop more detailed pathways to reduce their emissions, it’s important to fully understand our global emissions picture and how it has changed over time. 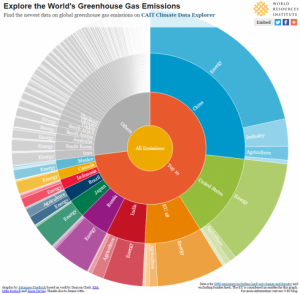 WRI recently updated its CAIT Climate Data Explorer on the world’s top greenhouse gas-emitting countries with the latest global data available (2013). Here’s an interactive chart to explore it by country and by economic sector, showing how the top emitters have changed in recent years. Originally published on the WRI website. 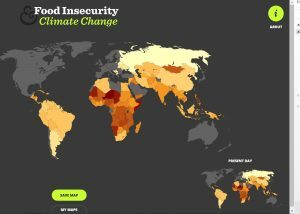 The World Food Programme has designed an interactive website that will allow users to explore different scenarios of global greenhouse gas emissions and adaptation to climate change, and how this could change the geography of food insecurity in developing and least developed countries. By altering the levels of future global greenhouse gas emissions and/or the levels of adaptation, you can see how vulnerability to food insecurity changes over time, and compare and contrast these different future scenarios with each other and the present day. Deforestation is a global problem, more so in the developing and the underdeveloped world, thanks to ineffective laws and corrupt administrations in some parts of the world. But help is at hand. Now, when a new road appears in the dense forests of Peru, or a patch of forest is felled Malaysia, anyone with an Internet connection can be alerted of the loss. A Landsat-based alert system, developed by the World Resources Institute as part of its Global Forest Watch network, gives near-weekly alerts for changes smaller in size than a football field. The tool uses imagery from Landsat 7 and 8 to monitor forests across the world every eight days. That revisit time, or data cadence, together with Landsat’s 30 meter spatial resolution, allows land managers to know when small incursions into forests are being made — in time to respond before further damage is done. Originally published on the Geospatial Website . The facts are startling. More than 2 billion people (CDC, 2015) worldwide suffer from micronutrient deficiency – 795 million (FAO, 2015) of whom are undernourished. The challenge to nutritiously and securely feed the growing population is further exacerbated by climate change which has led to extreme weather patterns and decreasing crop yields. With more than 10% of the world’s population living on less than US$1.90 per day (World Bank, 2016), the imperative to transform food systems in a way that simultaneously improves lives, livelihoods and the condition of natural resources is clear. Climate change presents a formidable challenge as one of the biggest constraints to improving food systems, food security and poverty alleviation around the world, especially for the world’s most vulnerable people. The impacts of climate change and poverty are closely interconnected (Bager, CCAFS) as climate change impacts land availability, rainfall, and disease. With poor people disproportionately dependent on rainfed agriculture for their livelihoods, these communities are thus especially vulnerable to the impacts of climate change. The increasing frequency and intensity of climatic shocks impinges on their ability to sell an agricultural surplus, meaning less reinvestment in their farms and other livelihood activities, and less ability to purchase a nourishing diet. The breakthrough Paris Climate Agreement of 2015, while far from perfect, represented an historic and ambitious new phase for climate action, and opened a door for the agricultural sector to take a leading role. 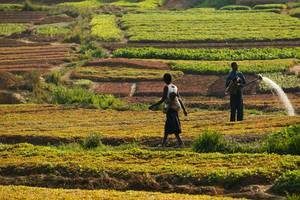 “We recognize that the agricultural sector has a key role to play in increasing resilience to climate shocks. Food security, food production, human rights, gender, ecosystems and biodiversity were all explicitly recognized in the Paris agreement and these are issues at the core of our work,” according to Elwyn Grainger-Jones, Executive Director of the CGIAR System Organization. 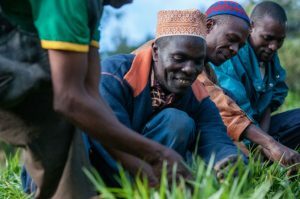 Across Africa, Asia and Latin America, CGIAR and its partners are developing climate-smart technologies to help farmers adapt to climate change as well as mitigate agriculture’s contribution to climate change. The CGIAR Research Program on Climate Change, Agriculture and Food Security (CCAFS) brings together the expertise in agricultural, environmental and social sciences to identify and address this nexus between agriculture and climate change. 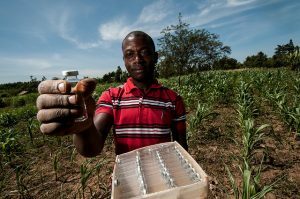 Innovations such as drought tolerant crops, agricultural insurance schemes and management practices for reducing greenhouse gas emissions are just a few of the technologies being developed by CGIAR. Originally published on the CGIAR website.